Papa Roach is a hard rock band from Vacaville, California, United States. Formed in 1993, it consists of Jacoby Shaddix (vocals), Jerry Horton (guitar), Tobin Esperance (bass), and Tony Palermo (drums). Tony, previously of Unwritten Law, joined the band after the departure of one of the band’s founding members, Dave Buckner. Their first major-label release was the triple-platinum album Infest (2000). The group's success continued with their gold album Lovehatetragedy (2002), their platinum album Getting Away with Murder (2004), The Paramour Sessions (2006), Metamorphosis (2009), Time for Annihilation (2010), and The Connection (2012). Papa Roach has sold more than 20 million album copies worldwide and are known for their songs "Last Resort", "Between Angels and Insects", "She Loves Me Not", "Getting Away with Murder", "Scars", "...To Be Loved", "Forever", and "Lifeline". 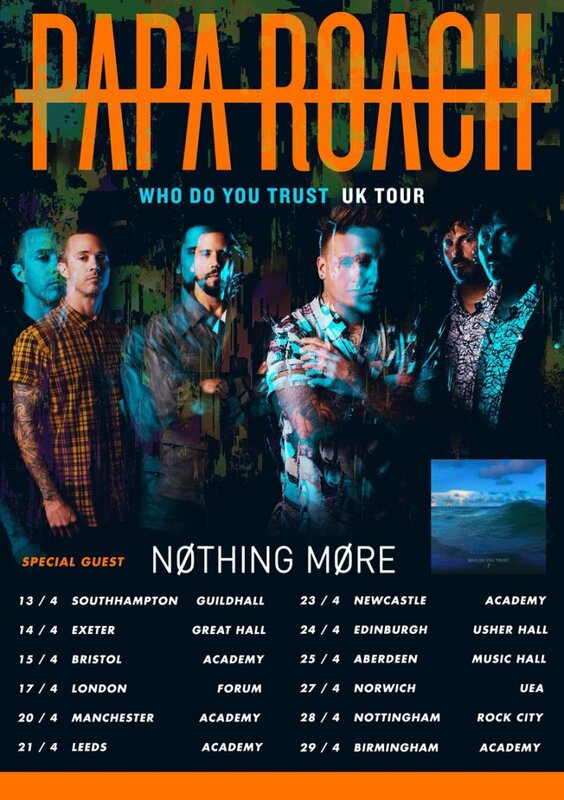 Papa Roach have established themselves on an international stage with every show jammed full of pounding guitars, catchy hooks and a raw energy that makes their gigs ones are not to be missed.